The temperatures have been rising all day. It was 17 when I got up this morning and, as I prepare for bed, it's 34. It is to be in the 40's tomorrow and the 50's on New Year's Eve before returning to winter next week. There is a lot of melting and it's noisy. 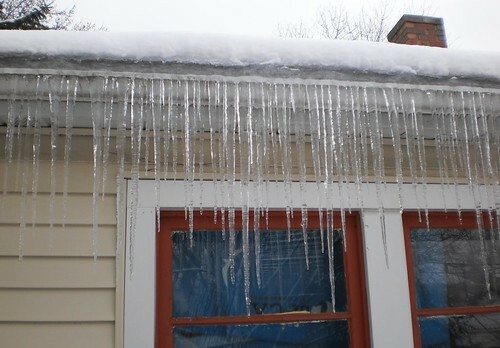 Monday, this was the state of icicles on the back of the house. I really need to clean out the gutters come spring. That would alleviate some of this. With the melting and the light rain we have now, a chunk of ice will come loose and fall off the gutter, hitting the window sill or just falling straight to the deck. The rumble thunk is random and every time tonight, I've jumped when it happens. I can hear the dripping as the snow on the roof melts but I'm just mentally unprepared for the sound of a chunk of ice falling. There is a rumor of heavy fog in the morning. Once again, I am bound into the city. The drive has been lovely with little traffic. A lot of people have this week off. But fog overnight and lingering into morning is going to ice the roads and make travel longer. And yet, it could make for a very nice atmospheric photographic opportunity. We shall...(there goes another chunk) see.